GSC Latin American Film Festival: FREE tickets for "Oscar Niemeyer: Life is But a Breath" AND "The Mystery of Samba"
Great news to share with you folks. Two movies will be screened for free to the public. 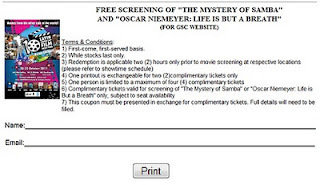 Here's your chance to redeem your FREE tickets for "Oscar Niemeyer: Life is But a Breath" or "The Mystery of Samba". Redemption will only be available 2 hours prior to showtime so don't forget to check out showtimes at www.gsc.com.my. Tickets are given out on a first-come, first-served basis so don't be late.